Big Japanese festivals are a fun, unforgettable — and often very crowded — way to see a bit of Japanese culture. 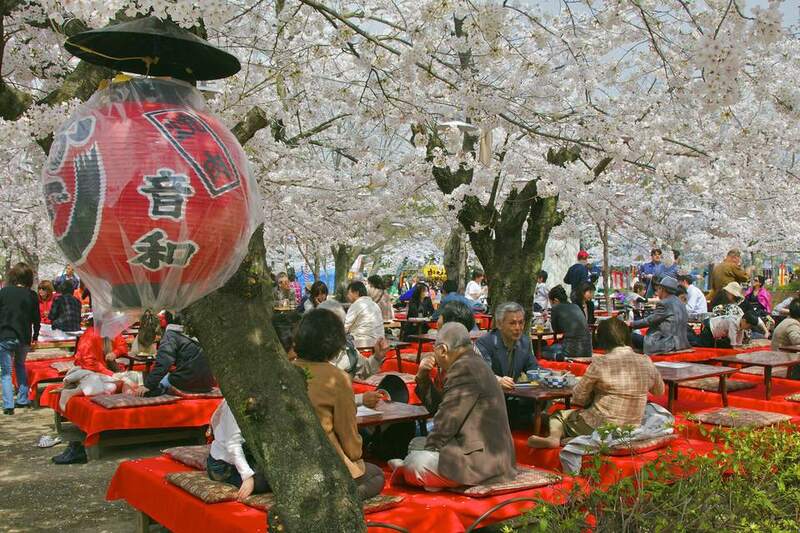 Although throwing beans to frighten evil spirits may bewilder and amuse first-time visitors, travelers can really get behind the joy that is hanami — the act of appreciating (and partying under) seasonally blooming flowers. The four consecutive public holidays that make up Golden Week in Japan are fun, but be prepared: half the country seems to traveling at the same time. Timing is everything when big holidays in Japan are concerned. Arrive a bit too late for the excitement, and your punishment will be inflated accommodation prices and overcrowded transportation. The worst part? You'll pay the dues without even getting to enjoy the fun! Don't miss out while traveling in Japan. Plan to already be situated for enjoying the big holidays, and maybe consider avoiding travel during the Golden Week stretch altogether. Bringing in the new year is taken very seriously in Japan. Shogatsu, the Japanese New Year celebration, falls on the familiar date of January 1 per the Gregorian calendar, but the celebration in Japan is stretched out days before and after. It's considered one of the biggest festivals in Japan. Shogatsu is observed by enjoying many traditional foods that vary between regions in Japan. Many people start the new year by eating soba (buckwheat) noodles at midnight for good health. At dawn, the Emperor of Japan prays for the nation. Unlike in the West where the celebration revolves around New Year's Eve revelry and short-lived resolutions, Shogatsu focuses on bringing prosperity in the upcoming year — beyond just hangover recovery. At midnight, Buddhist temples ring bells 108 times (the estimated number of worldly sins/desires). Much like Chinese New Year, special food is prepared and money is given to children in small envelopes. Reunited families spend time together and play games. The general sentiment is about new beginnings and setting the stage for prosperity. On January 2, the public gets a rare treat only granted twice per year: access to the inner palace grounds in Tokyo. The only other day that the public is allowed inside the gates is on December 23 for the Emperor's Birthday celebration. Many businesses remain closed until at least January 3. A smaller celebration known as Coming of Age Day takes place on January 9. When: December 30 to January 3. Note: The traditional Japanese New Year is also celebrated at the same time as the Lunar New Year (e.g., Chinese New Year, Tet, etc). Where: Nationwide. A large crowd will gather at the palace in Tokyo. Fun and bizarre, Setsubun kicks off the Haru Matsuri (Spring Festival) in Japan. Setsubun is an old tradition that has evolved into a televised event hosted by national celebrities. Along with the big productions, small stages are set up around the country, many at shrines and temples. Candy and money are thrown into the crowds which cheer and try to catch the small gifts. At home, families throw beans (usually soybeans) in mame-maki ceremonies to drive away evil spirits that could foul up things later. One member of the household dons a demon mask and plays the "bad guy" as everyone else shouts "get out!" and throws beans until he leaves. The door is symbolically slammed shut on the evil spirit. An ancient tradition, the word hanami actually means "flower viewing" and that's exactly what thousands of people do during the spring Cherry Blossom Festival. What could be more enjoyable than sitting under beautiful blooms with food and drinks? Families, friends, and coworkers compete for quiet spots in busy parks to enjoy picnics and parties. Events happen day and night. A little revelry takes place beneath the blooms that are celebrated for their fleeting, impermanent nature. Some festival goers may appreciate the sake more than the flowers themselves, but all enjoy the time outside in fresh spring air! Tea ceremonies are held under trees; folk songs, traditional dances, beauty pageants, and even parades add to the festive atmosphere. When: Dates range between March and May, depending on how far north or south in Japan. Blooms begin appearing in the south first as winter gives up. Officials predict and forecast the northern progress of blooms on government websites. If there's one big holiday in Japan to plan around it is Golden Week! Fail to do so and you could find yourself spending much of your trip waiting in queues. Golden Week is the busiest time to travel in Japan — it's not just a little busy but very busy. Four different, back-to-back Japanese festivals hit just as spring weather is turning pleasant. Japanese people take advantage by planning vacations; hotels, flights, and ground transportation fill up. Many businesses close for at least a week. Shrines and attractions in popular cities become very busy. The first holiday of Golden Week is Showa Day on April 29, the observance of the birthday of Emperor Hirohito. It is considered a time to reflect on that turbulent part of Japan's past. Constitution Memorial Day hits on May 3 and is followed by Greenery Day on May 4 then Children's Day on May 5. Although each of the public holidays during Golden Week aren't big events by themselves, combined they provide a good opportunity for local residents to close shop and take some time off. Japan's high season for tourism typically begins right after the Golden Week festivals clear up and business gets back to normal. Hotel prices will often be at their highest. Transportation gets crowded. Even if you aren't moving around, parks, shrines, and places you probably want to see will be inundated with people. Although technically not an official national holiday, Obon (sometimes just bon) is the most widely observed of Japanese festivals in the summer. Obon is a three-day celebration of ancestors' spirits that come home to rest. People visit shrines, temples, and family graves during Obon. Fires are lit in front of homes and lanterns help guide the spirits. Much like the Hungry Ghosts Festival observed in other parts of Asia, Obon is about keeping spirits happy in the afterlife. Obon is an important time for families; many head back to their ancestral homes, causing long transportation delays and some business closures. Shrines will certainly be busier during Obon. When: Obon is based on the lunar calendar. Dates vary from region to region, but the festival is always in the summer. Some regions celebrate on July 15, others on August 15 or the 15th day of the seventh lunar month. Emperor Akihito, the Emperor of Japan, was born on December 23, 1933. The date of his birthday is celebrated annually as a national holiday in Japan. The Emperor’s Birthday was established as an official holiday in 1948 and has drawn a large crowd to the palace since. The Emperor of Japan, along with key members of his family, make several short appearances throughout the day on a windowed balcony. They wave back to the sea of supporters who gather in the cold for a rare glimpse. Tourists are welcome to stand in the queue to join the spectacle. The Emperor’s Birthday is a patriotic occasion in Japan and is one of only two days each year when the inner grounds of the Imperial Palace are open to the public.